And to think I was a little bit worried. Last night on Alaska Airlines Field at Husky Stadium in Seattle, the University of Washington Huskies played the Brigham Young University Cougars. The Cougars were ranked at #20 and the Huskies were ranked at #11 going into this game. This was the second time the Huskies played a ranked opponent, the first time being their loss to Auburn. But this game was one mistake away from being a shutout for the Huskies. One the first two plays of the game, the Huskies showed brilliance. Then they had to punt. The Cougars made it to the red zone and had to try a field goal. They didn't get it. In fact, there were three field goal attempts in this game, one by the Cougars, two by the Huskies, and all three missed. That was the last time the Cougars would make it past the 50-yard line on their own. Then the Huskies just kept scoring. The score was 21-0 at halftime. And still the Cougars could not even make it past mid-field. With just a few minutes left in the game, the score 35-0, the Cougars punted (as they did so many times). It was raining and Chico McClatcher signaled for the fair catch but then he dropped the ball. The Cougars jumped on it and suddenly they were in the red zone. I think Husky coach Chris Petersen had put in back up players for defense because I didn't recognize any of the names. Still, it took the Cougars to 4th and goal to score in the final moments of the game. Still, the Huskies looked amazing. Running back Salvon Ahmed made two running touchdowns and he's just a sophomore. He has so much potential. Senior quarterback Jake Browning made all but two of this pass attempts (and there were a lot). He surpassed the all-time Husky record for passing yards by a quarterback last night. Myles Gaskin was his usual amazing self. The only part of the Huskies' game that needs improvement is the kicking game. Out kicker is a true freshman and he's done fine in other games, but here he missed two. Not that it mattered in the end. The final score was 35-7. This is the end of non-conference play for the Huskies. They are 4-1 overall and 2-0 in conference play. Next week we face a hapless UCLA team that is 0-4 overall. There is a slight danger of over-confidence playing a win-less team. But I think Coach Petersen is good and tamping down on that. We play that game in Pasadena so it's an away game for the Huskies. That game will be at 4:30 PM Pacific Daylight time on Fox. I'm a bit surprised a major network is carrying it with UCLA being as bad as they are. I thought the game might end up on the Pac-12 Network. because now Washington and Stanford are both 4-1 overall and 2-0 in conference and tied for the Pac-12 North championship. It may all come down to when the two teams play at Husky Stadium on November 3rd. Oregon, ranked at #19, beat #24 California so the Ducks are also 4-1 overall, but only 1-1 in conference. I suspect when the poll comes out, California will drop off. I wasn't sure why they were ranked, having a bye the week before they showed up on the poll. Washington State beat Utah, ending Utah's chances of winning the Pac-12 South. Colorado at 4-0 over all and 1-0 in-conference are on top of the Pac-12 South right now. USC is second at 3-2 over all and 1-1 in conference. Washington State is also 4-1 overall but 1-1 in conference (lost to USC last week). The AP Top 25 college football poll comes out at 2:00 PM EDT. That's 11:00 AM my time. So I'm always waiting for it to come out so I can finish this blog post. And then today it was delayed until 11:30. So I was quite annoyed. But I was happy to see the Washington Huskies move up to #10. Stanford dropped to #14 after their loss. Oregon climbed to #14 from #19. Colorado got into the top 25 at #21. And after losing to Oregon, California dropped back off after one week in the top 25. Washington is now the highest-ranked Pac-12 team. And, finally, BYU also dropped out of the top 25 after losing to Washington. The Huskies have to win every game from now on, including Stanford on November 3rd. 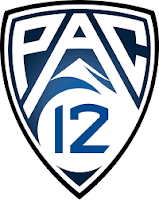 That is the only way they can be Pac-12 North Champions (unless Stanford looses an in-conference game other than to the Huskies). Then they have to win the Pac-12 Championship game to be Pac-12 Champions. Right now it's starting to look as if we might play Colorado again in that game. Then the Huskies might get invited back to the College Football Playoffs (CFP). I hope we don't play those cheaters, Alabama, again in our first CFP game. But that's a long ways away.